The Government of Canada has announced a large restructuring of its processing network in North America. Individuals who plan to submit an application in North America, or who have an application already in process, should be aware of these changes as they may affect processing location. The Buffalo, New York visa office will be closed shortly. The office is closed to the public as of 29 May, 2012, and will continue to accept applications that were postmarked on or before 30 May, 2012. As the Buffalo visa office gradually closes its operations, its caseload will be redistributed to other American offices, primarily the Canadian Consulate in New York City. Visitor visa, study, work permit, and change of status applications that are currently being processed in Buffalo will continue to be processed and finalized at this location. Persons residing in the US may apply for temporary resident visas at one of the following offices: New York, Los Angeles, Detroit, Seattle, or Washington DC. Individuals who require a Temporary Resident Visa (TRV) and intend to work or study in Canada must apply to the Canadian visa office responsible for their place of residence. Persons residing in the US east of the Mississippi River, Puerto Rico, Bermuda, or St. Pierre et Miquelon should submit their work or study permit applications to the New York City visa office. Persons residing in the US west of the Mississippi River should submit their work or study permit applications to the Los Angeles visa office. Foreign nationals in Canada with visitor status who wish to study or work should also apply to either the New York City of Los Angeles visa offices. 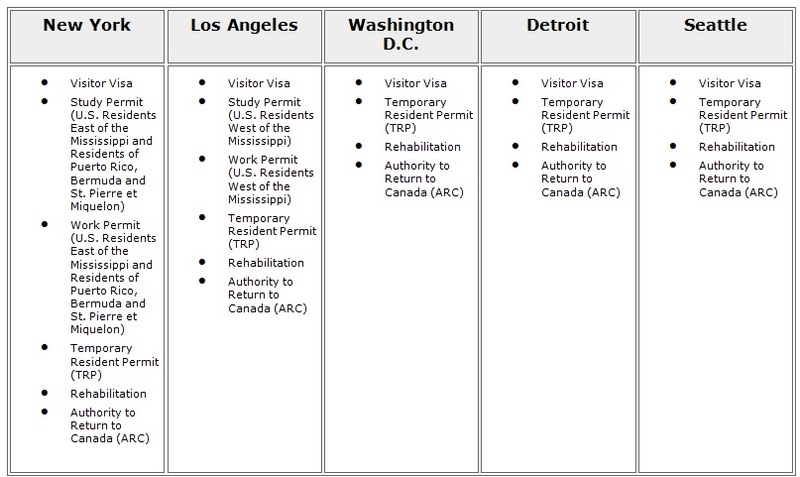 Applications for only a TRP, Rehabilitation, or ARC should be submitted to the visa offices in New York City, Los Angeles, Detroit, Seattle, or Washington DC. Cases where this may be applicable are, for example, individuals from a country that is TRV exempt and do not need additional authorization to come to Canada such as a study or work permit. Applicants who sent in requested additional documents do not need to re-send documents to Washington DC. They will be automatically forwarded with the rest of the file.